Enjoy remote viewing and control via your smartphone with this sophisticated home alarm kit. Complete control via Apple or Android SmartPhone. Email and text alert when alarm is triggered. Wireless PIR camera will capture images of intruder. Portable keypad for arming / disarming from any room. Components are pre-linked for an easy DIY install. Hub includes a back up battery in case of power failure. Alarm will accept up to 20 different components. 6 components can be Cameras or Video Cameras. With loud internal and external sirens to alert neighbours and occupants of any intrusion, the SR-330 also includes a PIR camera to capture images of any trespassers. Combined with instant email and text notifications when the alarm is triggered, you can quickly notify the authorities and provide useful evidence of any burglar entering the property. The Smart Hub with 94dB internal siren is the heart of the alarm system and is connected by an Ethernet cable (included) to your broadband router. Once connected to your router the hub connects via wi-fi to each device on your alarm system. The camera PIR should be placed to provide the widest angle of the room it is protecting. When the alarm is armed an infrared sensor will detect any movement and activate the loud external siren and at the same time capture still images (320 x 240 pixels) of the intruder. The images are then sent to your SmartPhone. You can also request still images of the room at any time via the SmartPhone app. In addition to SmartPhone control the keypad can also be used to arm or disarm the alarm system via entry of your own unique PIN code. The keypad can be fixed to a wall or carried around your home. Fitted in a highly visible location on the exterior of the property the loud 104dB siren will sound and the LED will flash when the alarm is triggered. Fitted to the exterior of the property the Dummy Box will add a further visual deterrent to a potential burglar. All the wireless components are linked together straight out of the box. There is no technical knowledge or wiring required to install a Yale Smart Home alarm. The alarm system will notify you by email and text if the alarm is triggered. 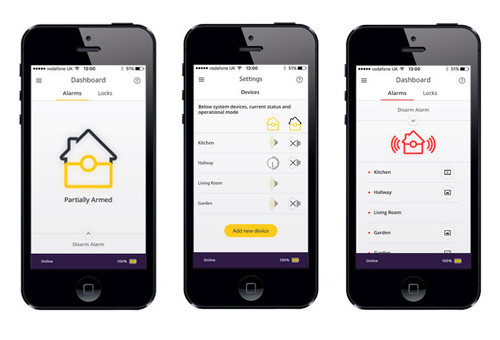 You can access all of the alarm settings and features via the Yale Smart Home Alarm App (available for iOS and Android). The system can be activated and deactivated using your SmartPhone and when used in conjunction with the PIR Camera or PIR Video Camera, images or video footage captured by the cameras can be viewed on the app. While the alarm is armed the PIR Camera or optional PIR Video Camera will capture still images or video footage when either PIR detects movement. The images or video can then be viewed on your SmartPhone using the Yale Smart Home Alarm App. Yale Smart Home alarms are designed to operate on on a frequency of 868MHz which uses a short duty cycle of only 1%. This means that any single device can only transmit for 1% of the time, leaving the channel free 99% of the time. When multiple devices are operating on the same system this technology ensures a more stable connection and little chance of interference. Many DIY alarm systems use a less regulated higher duty cycle reducing performance. A remote control device transmits a unique code to the control panel in most DIY systems. This unique code is used by the system to determine that the correct remote control is attempting to contact the control panel - for example not your neighbour's remote control. The problem with the unique code is that it might be possible to intercept it and as a result make a clone enabling someone else to activate the system. Rolling Code technology ensures this cannot happen by changing the unique code every time it is sent to the control panel, meaning if the code is intercepted it will not work again as it can only be used once - adding a further level of security. * Requirements: This alarm system requires a broadband internet connection with a router that includes one free wired network port. SmartPhone must be iOS 9.0 (iPhone 6 or above) and above or Android 4.2 and above.